Who doesn’t love a delicious gourmet meal? Imagine: you’re out with your spouse or significant other in a renowned steakhouse, ordering your hand-selected and trimmed steak that’s seared to your desired temperature and delivered to your table with the perfect side dishes, where you and your spouse or significant other enjoy the delicious flavors and never have to worry about the cleanup. Now – imagine this experience in the comfort of your home without the necessity of driving into the city! Our cooks prepare your steak to the perfect temperature, whether that means rare, medium rare, medium, medium well, or well done. Each of our locations offer a variety of side dishes to create the perfect gourmet meal in your home, such as fully loaded baked potatoes, grilled mushrooms, grilled onions, crisp salads, and, throughout the month of July, select locations are offering corn on the cob! 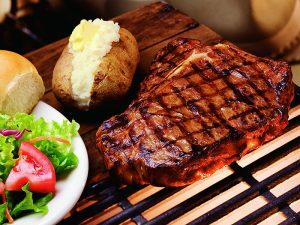 Once our experienced drivers arrive with your freshly-grilled gourmet steak meal, place all items onto your fancy dinnerware, pour some wine, light some candles, and enjoy a gourmet meal without the trouble of making reservations and driving into the city to find your favorite steakhouse. After all, food is one of the best ways to bring people together and share laughter and love, whether it’s between friends or family! Our gourmet meal delivery offers freshly-grilled, USDA grade steaks, crispy greens and sides ready whenever you are. Start planning your date night – or any special occasion – by contacting us online! Choose the Steak-Out location that’s nearest to your home, order your meal, and we’ll have it ready when you are! Celebrate National Grilling Month with Steak-Out!